I have lived in Berkeley California since the Summer of Love - and raised four children here. For most of my working life I was a registered nurse working with cancer patients. But I have always been an artist and found ways to be creative through dance, art quilting, and sculpture. 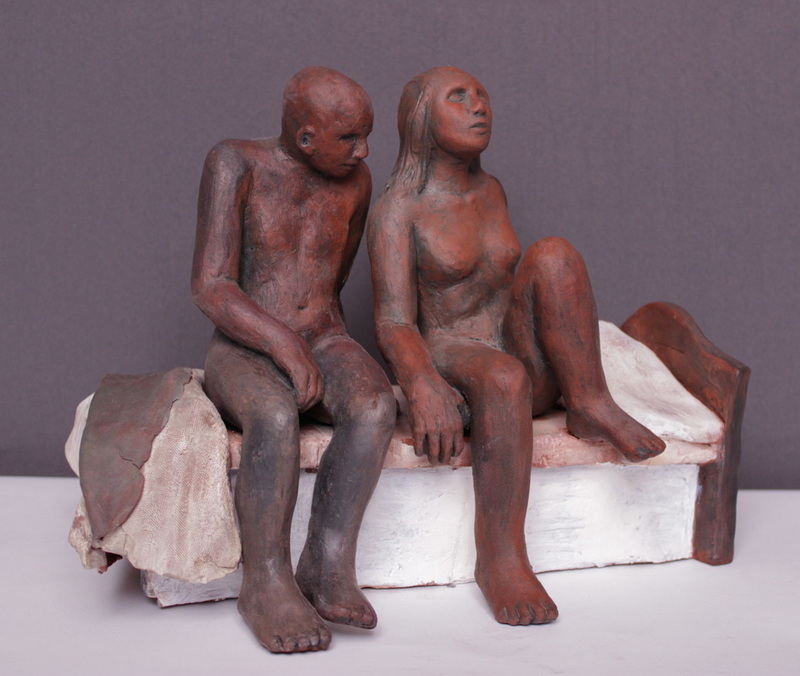 These are some themes that inspire my figurative sculpture. As a mother of four children I held babies in arms and had children underfoot for many years. I can feel the shape and weight of the relaxed body of a sleeping child. I can see the posture of a toddler leaning into the safety of her mother's knee. I know a mother's protective alertness - holding, hugging, comforting, watching. I can feel this in my body and aspire to find this within clay. Every window contains a tableau telling a story. When you look into a window you look into the private lives within. I try to capture that moment in time when a person pauses by the open window - they are looking out, and can look in. I love to imagine who the people are and guess what scene is playing out. Beds hold the conversation of the people who lie down together each night and rise up together each day. We all know the peace and comfort of sleep as well as the struggle to get through a sleepless night. I find the emotional content of those conversations can be expressed without words, by a body's tension or relaxed repose. I am also fascinated with the emotions found within everyday images, the isolation between people even when surrounded by others. There is that moment when you share a park bench with a stranger, or sit on the bus, or stand in line. I try to capture the relationship between people as they interact with each other or withdraw into their own thoughts. I also have a special interest and association with the images of angels - I see them as messengers of comfort, hope, and the promise of someday reuniting with ones we have lost from this world. Angels are agents of the life between lives. Angels call us home, and remind us that we are never alone.